Mt. Judea is a scenic, friendly place to visit and live. Although it is a small unincorporated town, it has a big heart. For the most part it is off the beaten path and yet has several highways going through or near it. The junction of highway 123 and highway 74 is located at the edge of town. Mount Judea has a US Post Office, a general store & gas station, a cafe, a clogging studio, a computer repair store, and a small rural school where the student to teacher ratio is so low that students get a lot of personal attention. The school is the major employer in the area and other businesses include farms, sawmills, and small, home-based businesses. If you are looking for a place to “get away from it all," Mt. Judea is it. In a valley surrounded by tall mountains, winding waterways, and forests, Mt. Judea has something for everyone. Residents are often seen riding their four wheelers or horses. In the summer they go to the creeks and Buffalo River to cool off in the water. Canoeing and fishing on the Buffalo is a favorite pastime for residents and vacationers. 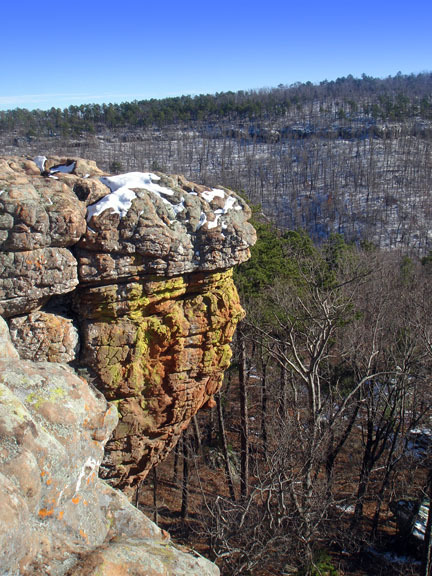 Those who are more adventurous go to the mountains to climb at either Sam’s Throne or Rock Gap. While hunting elk with a rifle is limited to a chosen few, hunting with a camera is open to everyone. Other wildlife that one might see in the area: whitetail deer, turkey, coyotes, bobcats, black bear and small game such as squirrel and raccoons, and don’t forget our national bird, the Bald Eagle. For those who like their privacy but also like to be among others, there are many activities in the area. For the children there are 4-H clubs, Girl Scouts, and sports. For the adults there are groups like the volunteer fire department, the fire department’s ladies' auxiliary, the Mt. Judea Area Alliance, several places of worship, Parent Teacher Partnership, and many opportunities to volunteer.